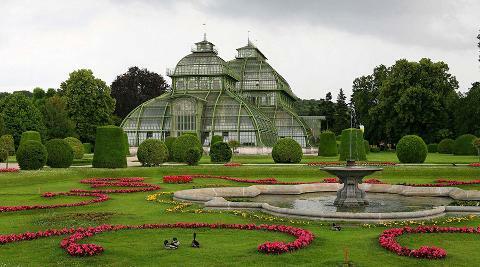 We begin our encounter with the astonishing High Baroque Schönbrunn Palace (built to rival Versailles) with a stroll through the magnificent formal gardens, exploring the Baroque landscaping principle of interlaced nature and architecture that is illustrated everywhere in the layout of the grounds. 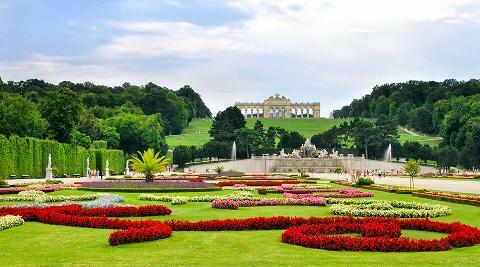 Approaching the Gloriette, a huge triumphal arch situated on a hilltop with panoramic views of Vienna’s woods, we recall the military victories that made Empress Maria Theresa’s reign (1740-1780) a highpoint of the Hapsburg dynasty’s political and cultural dominance in Europe. The park was opened not only to the court but to the general public from 1779, a populist gesture that reveals Maria Theresa’s canny charm offensive towards her subjects. 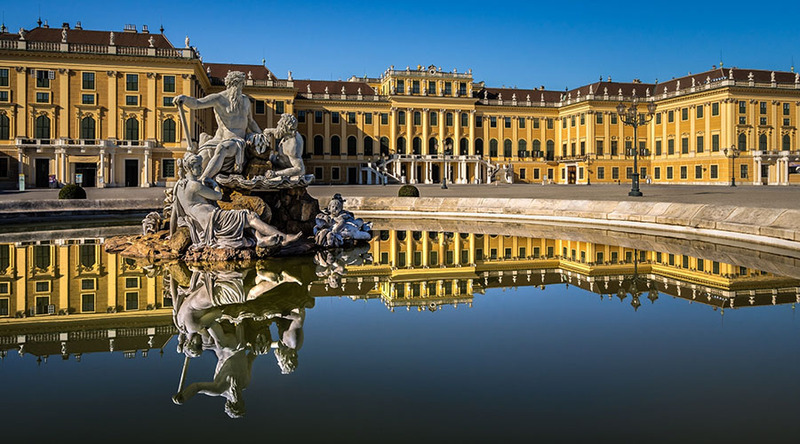 Indeed, it was under Maria Theresa’s direction that Schönbrunn Palace became the focal point of Austria’s imperial policy and the centre of court life, in addition to functioning as the summer residence of a reigning family counting not less than 16 children! Several of this teaming brood of young royals did not survive to adulthood but the palace preserves the memory of their infancy, childhood summer activities, illnesses and early loss. 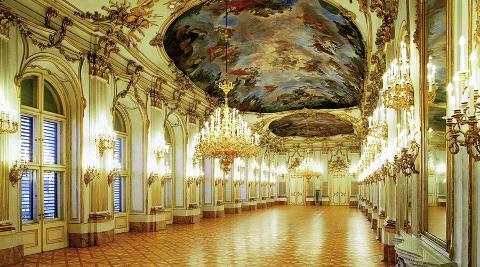 For example, Maria Theresa’s music room was the setting of acoustical delights attended by the imperial family in a glittering Rococo ambiance of gilt mirrors and lavish chandeliers. The six year old Mozart performed here for the family. The Hapsburgs’ devotion to the development of classical music did not end at their support of brilliant professional composers; many of the children were trained themselves as advanced musicians and expected to exhibit their skills in private entertainments held in this space. The Empress herself acted in plays in the private theater. The next generation of Hapsburg rulers also put their stamp on Schönbrunn. The Franz-Joseph & Elisabeth Apartments tell the story of a couple torn apart by the burdens of state. 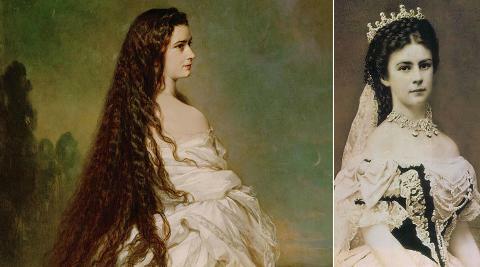 In 1854, Emperor Franz Joseph married the Bavarian princess Elizabeth (known better under the affectionate nickname Sisi) who despised the rituals of court life and the ornate environment of the summer palace. Sisi commissioned a spiral staircase leading from her official rooms to a private entry from which she could flee the palace to the gardens. Visiting one lavish room after another gives us an ample sense of the opulence which country-reared Sisi fled: The dining room with precious tableware and “imperial napkins” in the form of a “fleur de lys” witnessed countless state dinners; the Hall of Ceremonies records the pompous Baroque celebrations it hosted, such as the wedding of Crown Prince Joseph, depicted in a series of scenes by court painter Martin van Meytens; the so-called “Porcelain Room” (office of Maria Theresa), completely done in imitation of precious china with orientalist drawings drafted by the imperial children. The unique “Millions Room” owes its name to a fabulous price in gold ducats paid for it: antiquated Indo-Persian miniatures with rococo-frames, wall hangings manufactured of carved rosewood from the Antilles make the “Millions chamber” one of the most accomplished combinations of Oriental and European decorative art from the Rococo era.